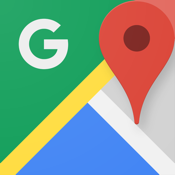 Google Maps by Google, Inc. makes sure you find what you're looking for easily and quickly. This app provides you with up-to-date, accurate, and easy-to-read maps. There's no such thing as being lost when you've got this app on your mobile device. Find all the places to shop, eat, drink, and hang out. Not only that but you can even read reviews and ratings from users you trust. When it comes to finding locations the search function allows you to find places, businesses, and addresses. If you sign in you can sync the directions, searches, and your favorite places. Your directions can be provided to you through voice turn-by-turn direction if you like. As well you can get public transit and walking directions. Google Maps famous street view makes the streets feel as though they are popping off the screen, letting you look inside over 100,000 worldwide businesses. Of course one of the greatest features here is just how easy this app is to use. Its all new streamline user-interface makes for a better experience that is faster, and more simple. You can also now use gestures to move around on the map. Google Maps was updated on Mar. 5, 2013 and currently has 173 customer ratings with an average rating of three and a half out of five stars. When it comes to finding directions I’m a stickler for Google Maps. This app never seems to let me down, giving me easy to understand directions to any place I throw at it.